Clarifye maps the precise digital "fingerprint" of your eyes, to pinpoint the exact prescription. 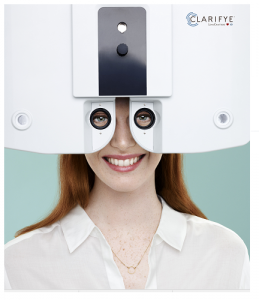 This new eye exam technology is offered at The Eye Center by Lenscrafters. 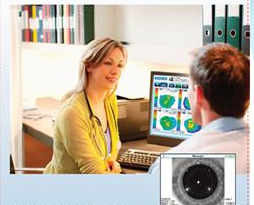 Clarifye combines advanced digital technology with the personalized touch of skilled optometrists. During your eye exam, we do a comprehensive assessment of your eye health. Clarifye helps identify conditions such as macular degeneration, cataracts, diabetes and other health issues, even earlier than other diagnostic tools, so we can protect your precious sight with preventative eye care. We will review your Clarifye results together with you, viewing the advanced digital images of your eye for a comprehensive assessment of your eye health and vision. As your eye doctors, we will provide a digitally precise prescription, advise you about your eyewear and lenses that are customized for your lifestyle needs, and recommend important steps you should take to protect your sight long term. Clarifye: A State of the art, digital eye exam that includes a high definition health scan of your eyes! Dr Kassam, Dr Besharat, Dr Esmail, Dr Chowdhary, Dr Middleton, Dr Walent III, Dr Bakir, Dr Miller, Dr Graves, Dr Ritter, the optometrists at The Eye Center's multiple locations across North Carolina, are proud to offer this amazing new technology to our patients at all of The Eye Center locations in Durham, Fayetteville, Burlington, Wilmington and North Hills, NC. Exclusively at Lenscrafters.